Care for and nurture a tribe of little people by teaching them the basics of survival. 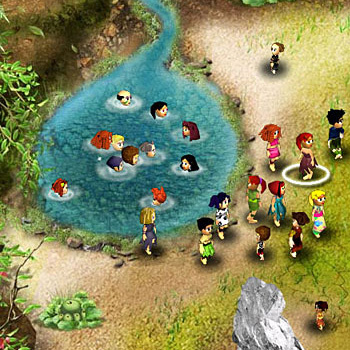 Fleeing from a volcano eruption, your little villagers find themselves stranded on a mysterious new island. They need to become farmers, builders, scientists, parents and make decisions about unpredictable 'island events'! Guide their day-to-day lives and help them explore and restore their new home. As your village grows and prospers, your villagers become curious about their mysterious new island home and the secrets it holds.